It is responsible for packaging proteins into vesicles and sending them out to the correct destinations within the cell, where the proteins are used to carry out the requisite cellular functions. The Golgi apparatus is made out of stacks of different sizes linked together by tubular connections. The tubular connections are made out of microtubules, and the stacks of cisternae which make up the Golgi body originate in the endoplasmic reticulum and bud off. The Golgi bodies found within mammalian cells are usually made out of 40 to 100 layers of cisternae, with four to eight cisternae comprising an individual stack. Some protists have Golgi bodies with as many as sixty cisternae per stack, however. The location of the Golgi apparatus varies between eukaryotic organisms. Most mammal cells have the Golgi apparatus located near the centrosome and the nucleus of the cell. Plants cells have stacks of Golgi that aren’t concentrated around the centrosome and don’t have the ribbon structure that the Golgi body does in other cells. The Golgi body is usually located close to the exit sites of the endoplasmic reticulum, which allows it to have quick access to the proteins made by the ribosomes, which are found in the endoplasmic reticulum. 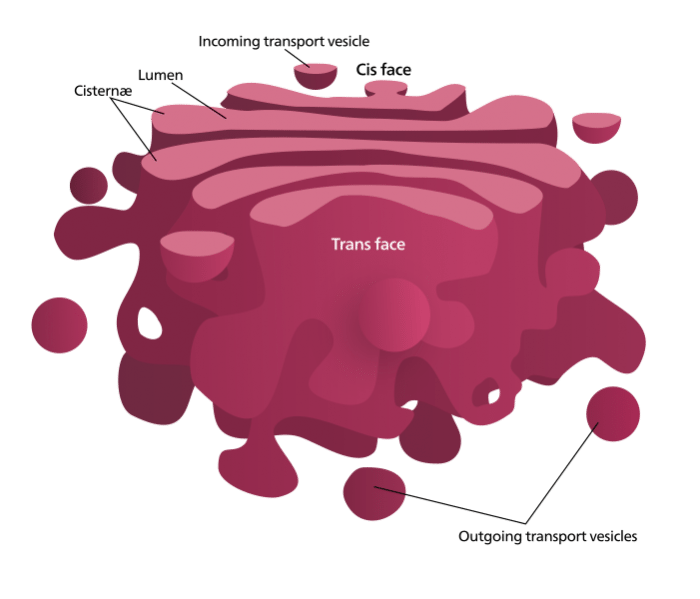 There are two different compartments within the Golgi body – the trans-Golgi network (TGN) and the cis-Golgi network (CGN). The CGN is the structure that takes in proteins and the TGN is the network that packages the proteins for transport to other areas of the cell, putting them into vesicles. The vesicles will then exit the TGN and move along through the cytoplasm of the cell to the cell surface, specialized secretory vesicles, or the lysosomes. The TGN is sometimes connected/adjacent to the rest of the stack, though it can also be separated from the stack. Endosomes are components of the endocytic membrane that transports things away from the Golgi membrane. Every cisternal stack has a cis-entry point and a trans-entry point. Every entry and exit point has its own unique biochemistry and morphology. Every unique stack also has its own enzymes which function to modify the protein cargo that moves through them. The compartmentalized nature of the Golgi body is useful for keeping enzymes separated, making sure that the proper enzymes only act on their respective targets, restricting processing to several different steps. The Golgi apparatus is usually larger and bigger in cells that create substantial amount of substances for use in other parts of the body. Plasma-B cells, for example, have to make large amounts of antibodies since they are involved in the immune system, and as a result they have larger Golgi bodies. The primary function of the Golgi apparatus is to collect proteins, prepare them for transport, and then send the proteins out to the correct destination. For this reason, the Golgi body is frequently referred to as the “post office of the cell”. The cargo proteins that the Golgi body collects are modified and prepared for distribution by the process of exocytosis. The vesicles that carry the proteins leave the Golgi body and are sent out to either different portions of the cell or to extracellular space. The Golgi apparatus also plays a role in lysosome formation and the transportation of lipids. 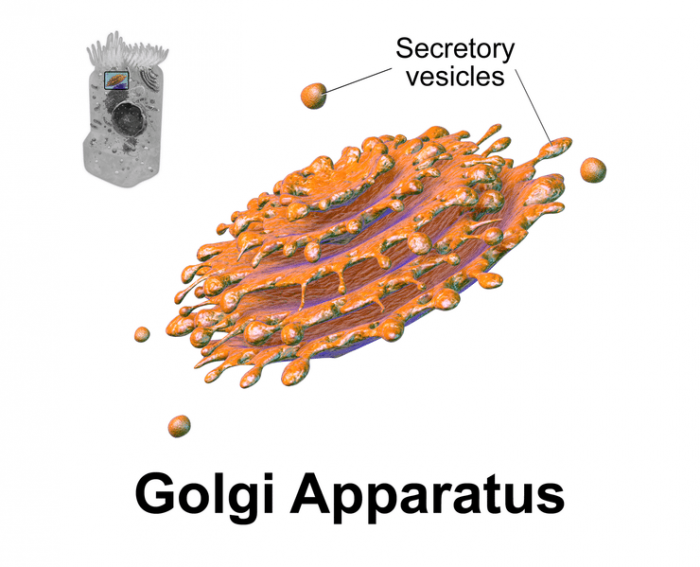 The function of the Golgi body is intimately tied to the structure of the Golgi body. The individual stacks of cisternae within the apparatus have various enzymes that allow the proteins to be processed as they travel through the Golgi apparatus to the trans-Golgi end. The enzymes found within the Golgi apparatus react with the proteins primarily near the surface of the membranes, as the enzymes are plugged in there. This differs from the endoplasmic reticulum which has its enzymes within its lumen. The modification of proteins in the Golgi apparatus can form a sequence of chemical signals used to classify the protein’s destination. As an example, proteins bound for the lysosomes have a mannose-6-phosphate label appended to them. The Golgi apparatus has another important function, namely the creation of proteoglycans. Proteoglycans are proteins which have been glycosylated, meaning that they have had a carbohydrate attached to them. Enzymes found within the Golgi apparatus add proteins to the glycosaminoglycans, which are long molecules of polysaccharides found within the extracellular matrix. This addition of these molecules to proteins leads to the formation of proteoglycans. 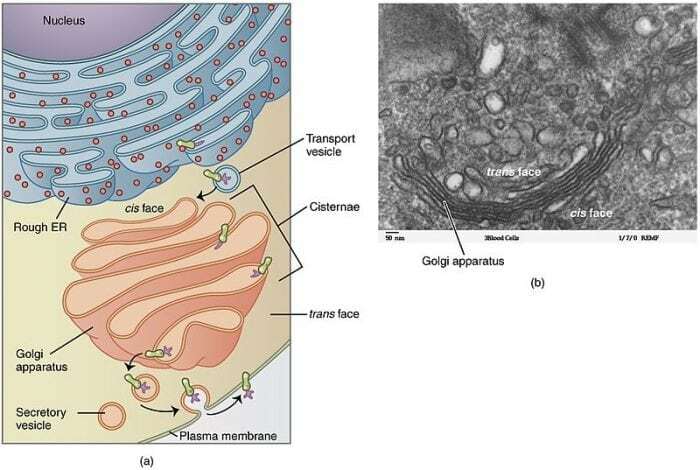 Vesicles that end up exiting the rough endoplasmic reticulum are taken to the Golgi apparatus, specifically the cis face of the apparatus. Here the vesicles will fuse with the membrane of the apparatus and release the contents within them into the lumen, where the molecules can then be modified and prepared for transportation to their next destinations. The proteins that will go to other areas of the cell (with the exception of those bound for the endoplasmic reticulum) head through the Golgi apparatus to the trans-face of the apparatus. The function of the transcoding network is to sort proteins and ship to their correct destinations using one of three different vesicle types. The three different vesicle types the Golgi apparatus uses to accomplish protein transportation are: exocytotic vesicles, secretory vesicles, and lysosomal vesicles. The exocytotic vesicles and the secretory vesicles are those that contain proteins tagged for release outside the cell. The lysosomal vesicles are those which are tagged for delivery to the lysosomes. Examples of exocytotic vesicles include antibodies relased by plasma B cells, while examples of secretory vesicles include neurotransmitters. Finally, exampes of lysosomal vesicles include certain digestive enzymes intended for use in the lysosome.